Melt the butter in a large pan over medium-low heat, add the onion, sugar and salt and cook them, stirring frequently, until the onion is golden, about 5-8 minutes. Stir in the beer, scraping up any bits from the bottom of the pan. 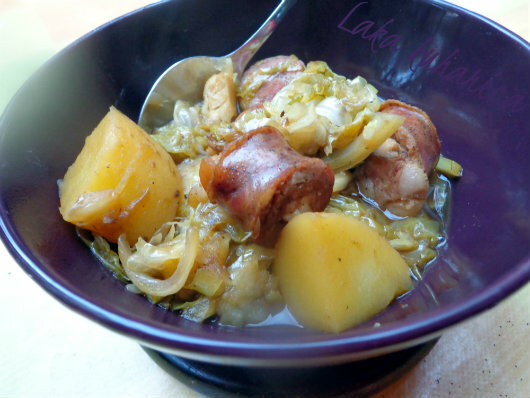 Add the sausages, cabbage and potatoes and simmer, covered, stirring occasionally, for 20 minutes or until the vegetables are tender. Serve the sausages and veggies in big bowls with plenty of the cooking liquid, sprinkled with freshly cracked pepper.